икониIt’s summer and it’s hot and the sun was blinding. I don’t handle heat particularly well. 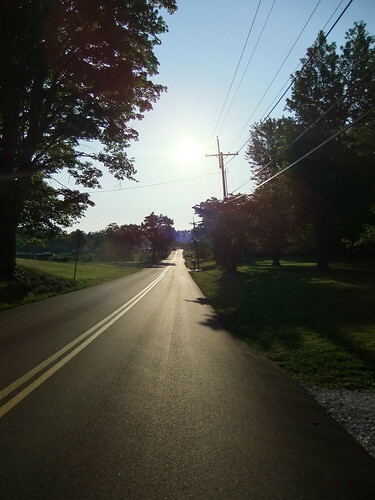 But as I rode along this brand new asphalt I thought “Damn, this is nice!” And my photo conveys the feeling well. Unfortunately they haven’t finished repaving this stretch of road yet and when the new pavement ends, it’s been milled and is just sitting there in very rough shape. It’s doable on my road bike, but only barely. I can’t wait until the whole road has been resurfaced. 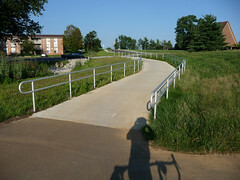 Bloomington recently (this Spring) completed construction on a bike and pedestrian underpass under the very busy 45/46 Bypass. This is a very busy road in town that was recently widened to four lanes in that section. Sadly in the past there was no good way to get across on a bike or on foot … you had to just wait for a gap in traffic, which could sometimes take several minutes. When I lived on the east side of Bloomington, I had to cross the Bypass twice daily on my bicycle commute, and it was often a source of frustration. So, has the city fixed the problem? 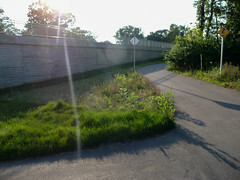 To find out, I incorporated the underpass in a recent ride, since I had yet to see it. I like the idea of an underpass, but the execution leaves a lot to be desired. You have to go well out of your way to reach the underpass. Whether you’re coming from the east side or the west side, it appears that you have to cross the the Bypass immediately ahead of you to get to the other side. It’s not at all obvious that if you go down another path, there is a safer crossing. 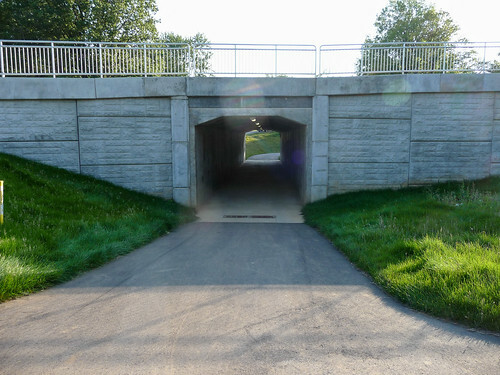 The underpass is at least half a block out of the way, and from the east side I also had to counterintuitively ride on a bike path against the flow of traffic, crossing a few driveways, which could be dangerous. Overall the extra distance only adds a few minutes on a bike, but it would actually add significant travel time if you were on foot. 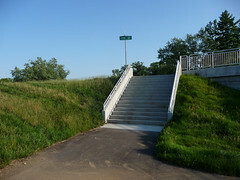 The path also has some switchbacks in it, which are kind of fun, and help slow down bike traffic and make the grade less steep. The other main problem that I see is that the whole thing is very poorly marked. I saw no signs even indicating that the underpass existed in logical places. 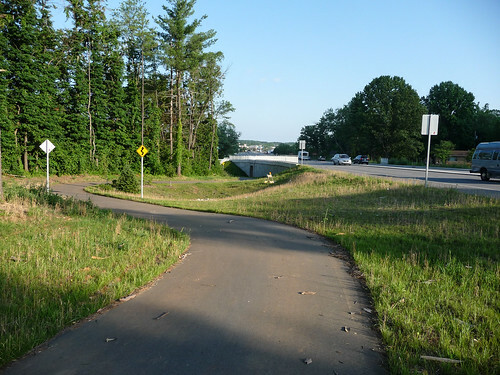 Also, a number of different paths converge at the underpass, with no indication of where they lead. Finally, when I got to the other side of the underpass and came to an intersection, there was no indication of where to go. Fortunately, I know my way around that area well, so I knew where to go, but not everyone does. I’ve seen people still running across the Bypass on foot. I don’t know if they didn’t want to go out of their way to use the underpass, or if they didn’t know it was there. Now that the Bypass is 4 lanes of traffic, running across it is more dangerous than before. If this piece of infrastructure is going to be useful to anyone, they have to know it’s there. I personally think it’s too far out of the way to be useful for pedestrians, but on my bike, I will take advantage of it. As I attempt to get back in some semblance of shape, I’ve been doing some rather short rides (20ish miles), usually only riding one major hill in a ride. I’m a little surprised at how bad my fitness is at the moment, but I’m going to work up to longer rides gradually … especially given that the weather is finally heating up in what has been a relatively cool summer thus far. My riding buddy Dave is in a similar situation, also having ridden relatively little, although I think he’s better off than I am in the fitness department. At any rate, this weekend we met up for a ride of about 27 miles. It was the hottest day in a while — in the upper 80s, but it felt hotter to me. While we stood in Dave’s driveway deciding on a route, I felt like I was roasting. When we rolled out, there wasn’ t a cloud in the sky. Once we got moving, we generated enough breeze that I felt quite a bit better. 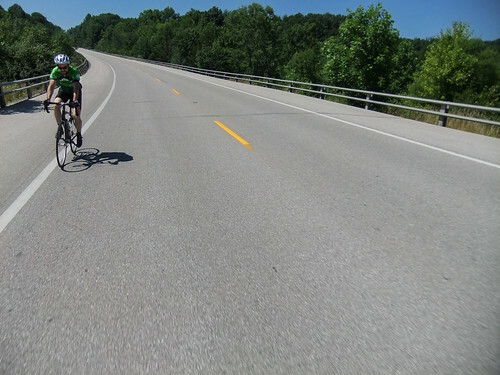 It also helped that the first portion of our ride seemed to have a fair number of downhills. A fun start! Oddly there was a relatively large amount of traffic, given our relatively remote riding area and the fact that it was a Sunday. There were a lot of cars, but every single one was courteous, so it wasn’t too bad. This run down State Road 45 was especially exhilarating. 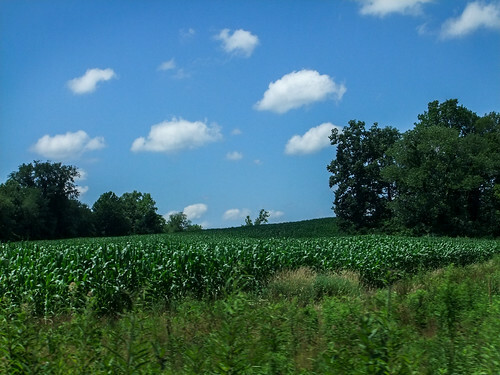 After a while we arrived in Beanblossom, IN. We stopped under an awning to rest and have a snack, and debated whether to go for more miles, or turn back. I was feeling sluggish and it was only getting hotter, so we turned back. Naturally, after the snack I got a second wind and probably could have ridden further, but I still think it was the right choice at the time. 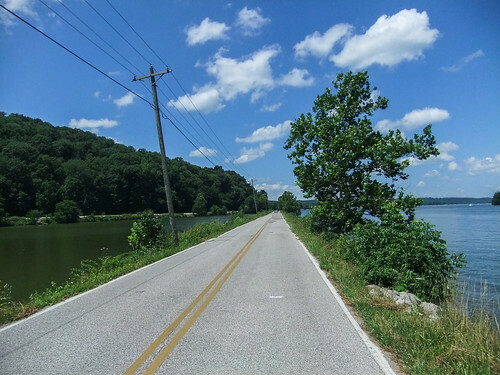 Our route took across across the causeway on Lake Lemon — always a favorite spot for me. 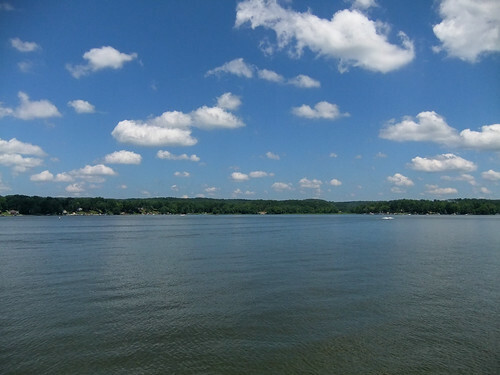 The breezy air and the number or boats made some waves on the lake. After you cross the lake, you have to climb a big hill. There are a couple of different roads you can take. Dave and I always disagree about which one is less painful. On this ride we went with his preference and climbed on South Shore Drive. I think this climb is particularly brutal because even though it starts out at a reasonable grade, and even lets up for a moment, you get 2/3 of the way up the hill, THEN it gets steep. By the time I reach that point, I’m often running out of energy. I was hoping that the climb wouldn’t be as bad as I remembered, but it really was about how I recalled. I made it up without stopping, but I was exhausted when I reached the top. My preference is to climb Shuffle Creek Road. The maximum grade is higher, but the steep portion is at the bottom, and you get past it quickly and then it’s not so bad. At any rate, the climb was doable and overall it was an excellent ride. I’m definitely itching for more rides. Unfortunately it’s getting quite hot out, and I sometimes have trouble dealing with heat. I guess I’ll just have to get used to it. Here is our route. I’ve been using Strava lately — feel free to add me on there if you have an account.